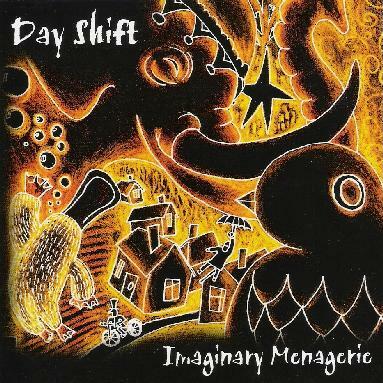 Day Shift - "Imaginary Menagerie"
Day Shift are from the south of England, and though they only formed in 2004 they've released a strong debut album that features a tight quintet that play a space, psych and progressive influenced brand of song oriented hard rock. The band consists of Bob Leek on vocals & synths, Nick Neere on guitar, Jason Tilbrook on bass, Archie on drums and Henry Crud on theremin (wasn't Henry Crud a Goon Show character?). I see on their links page that Archie also drums for Blue Drift and The Morrigan, both prog rock bands we've reviewed in the past. The CD opens with "The Clothes Horse", a tight and heavy hard rock number with psychedelic and prog rock influences, a solid melodic sense, and nicely embellished with bubbling space rock synths. A strong opening track. "The Happy Elephant" continues down a similar road, but this is a really hot track that brings to mind the last few Porcupine Tree albums, but with the spacey influences that Mssr. Wilson seems to have dispensed with. A killer tune that beautifully incorporates space rock and psychedelia into a song oriented hard rock context. "The Alternative Magpie" and "The Abstracted Sloth" are more strong songs with an excellent blend of hard rock and psychedelia, the later colored by Ozric Tentacles styled keyboards and some killer soaring spacey guitar licks. "The Unwashed Platypus" is the closing track and starts off very mellow and drifting, and reminds me a lot of earlier Porcupine Tree. It builds up slowly, the volume and intensity level building while retaining a floating quality. Then a few minutes into the song Nick takes off on an out of this world guitar solo that recalls the most tasteful of Dave Gilmour moments. The band soon starts to rock out, only to recede and transition to a spaced out, flowing synth segment that's like a cross between the Ozrics and Harvey Bainbridge. And at 14 minutes these guys really take off and jam on what is their most overtly space rock track of the set. Outstanding!! In summary, Imaginary Menagerie is a potent set, with well written songs and driven by a knockout punch guitar style. If Day Shift are this good after only having been together since 2004 then they've got nowhere to go but up. I hope to hear more from them soon.